In a Nutshell: Starting a new business was once a financial gamble, but, thanks to the proliferation of e-commerce, which has made it easier to find and sell to a market, it no longer has to be. 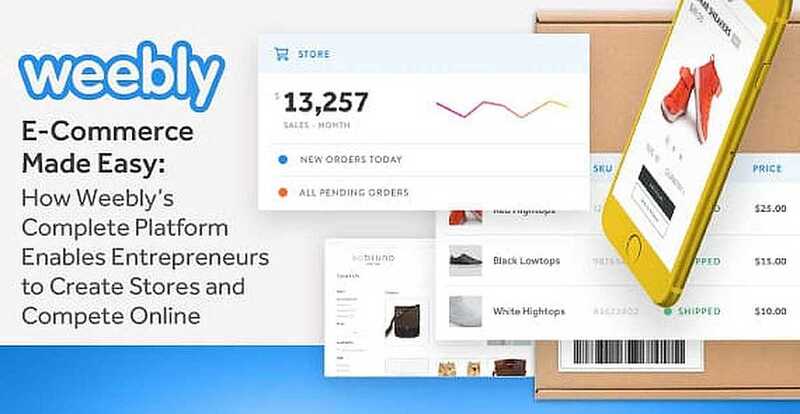 Focused on making the process of launching an online store accessible to anyone regardless of technical prowess, Weebly helps entrepreneurs get online and reach a global market in a matter of hours. Its drag-and-drop interface allows for the creation of beautiful, functional web stores with zero hard coding. Weebly considers its customers partners in the process and relies heavily on feedback to guide product development, which has led to innovations like built-in targeted email marketing and mobile store management. A couple of decades ago, aspiring entrepreneurs faced a much bigger barrier to entry into the marketplace. Not only would they have to come up with a great idea, they would also need a business loan to open a store, hire employees, fill the shelves with product, and then they’d hope for success. Thanks to e-commerce website building platforms like Weebly and a growing digital marketplace, entrepreneurs can quickly get online to sell their products without taking a massive risk that could ultimately lead to financial ruin. 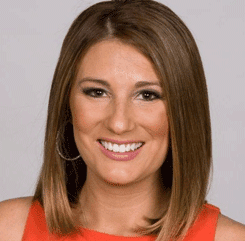 Kim Chappell, Head of Communications at Weebly, told us simplicity is in the platform’s DNA. “It’s never been easier for someone to go from idea to selling to a global audience almost overnight,” said Kim Chappell, Head of Communications at Weebly. In 2006, David Rusenko, Dan Veltri, and Chris Fanini were students at Penn State looking to simplify the development of highly functional, professional-looking websites through a drag-and-drop interface. Their creation, Weebly, has since helped people with little to no coding experience create beautiful e-commerce sites that allow them to compete with larger organizations. One Weebly customer who has seen international success is Kate Sullivan, a Cooperstown, New York, resident who has sold more than 10,000 units of her knitting product, Yarnit, to an international audience. Kim told us Weebly likes to consider itself a partner to those who start business websites on the platform. Simplifying the process of designing an e-commerce storefront with the look and functionality of a much bigger company is part of it. With a range of templates and themes that can be customized with photos and logos through its drag-and-drop interface, users can rapidly make websites their own. And since a web store needs to be more than just attractive, Weebly has tools that allow users to manage every aspect of their business from product pages and shopping carts to tax details and inventory management. Weebly has partnered with payment processing partners, such as PayPal, Stripe, and Square, to help ensure smooth, secure transactions, and the Weebly App Center includes more than 200 integrated applications that handle tasks like social media engagement and campaign management. These robust features and integrations empower entrepreneurs to simplify the process of starting an online business. Since customers are considered partners by the Weebly team, it makes sense that they would value customer feedback in driving product decisions. What might surprise you, however, is that a Weebly customer calling for support might actually end up talking to one of the founders if they call on the right day. Weebly goes further by hosting a community forum, where customers can suggest new features. All of this feedback is used when Weebly innovates its products, and the company’s release of Weebly 4 added integrated email marketing and enhanced dashboard insights to give customers what they needed to be successful. Weebly’s e-commerce customers, particularly those who run businesses as side projects, tend to wear a lot of different hats each day. However, email marketing is extremely valuable for driving sales, which led to the release of Weebly Promote, which integrates directly into sites to drive lead generation for entrepreneurs’ sites. “Our goal has truly been to simplify every step of the way for them, and with this email marketing platform, because it’s connected directly to your e-commerce store, we’re able to send them out to all of the different types of customers that are coming to your store,” Kim said. 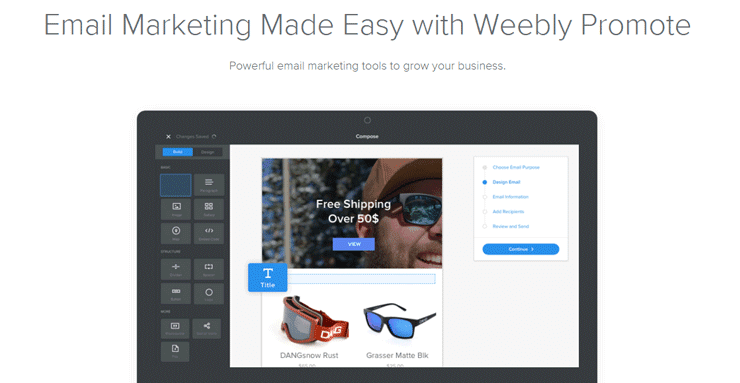 Weebly Promote is an email marketing platform that integrates directly into users’ sites and helps drive traffic. Weebly Promote automates email marketing, sending targeted messaging to different customer segments based on previous buying behavior. One Weebly storefront that’s seen tremendous success using Weebly Promote is Dang Shades, which sells sunglasses and ski goggles. Through integrated email marketing, Kim said the site saw 40% of online sales from email campaigns over a three-month period. In a world that’s gone increasingly mobile, it just doesn’t make sense anymore for store owners to have to sit down at a desk to manage orders or edit their e-commerce sites. Recognizing this need, Weebly has created mobile applications compatible with iOS and Android devices that allow entrepreneurs to run virtually every aspect of their business from wherever they are in the world. Weebly site owners can create and edit product pages, add new photos, change product descriptions, and lower prices directly from their smartphones or tablets. When a customer places an order or has a question, site owners receive notifications, ensuring that they never leave their customers hanging. Many people who start selling through the Weebly platform start businesses as passion projects or side hustles. Since the barrier of entry is so low, they can still keep their day jobs while testing the market before deciding to take the definitive leap of faith to become their own boss. One couple who started a passion project on Weebly that’s turned into a full-time job are Chris and Paige Curtis, who started small by building picture frames out of repurposed wood and have now processed more than 10,000 orders on Alibi Interiors. “I knew that I would be happier making $10 an hour working for myself than $25 an hour working for somebody else,” Chris said. Through a platform that makes selling online easy for everyone, Weebly is doing its part to empower entrepreneurs and set them up for success in a global online marketplace.